Paul Whiterock smells marijuana for sale at 420 Sahara Wellness in Las Vegas on July 30. Nevada regulators and industry insiders say the state’s first year of adult-use marijuana sales has exceeded their expectations. 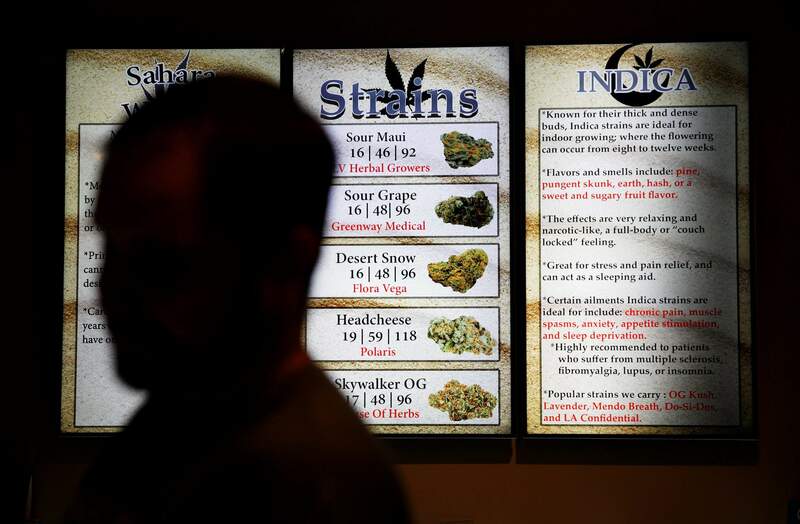 Screens display different strains of marijuana at 420 Sahara Wellness in Las Vegas on July 30. Nevada regulators and industry insiders say the state’s first year of adult-use marijuana sales has exceeded their expectations. Marijuana is on display at 420 Sahara Wellness in Las Vegas on Aug. 1. Nevada regulators and industry insiders say the state’s first year of adult-use marijuana sales has exceeded their expectations. Christine Glenn sorts marijuana at the Blum marijuana dispensary in Las Vegas on Aug. 1. Nevada regulators and industry insiders say the state’s first year of adult-use marijuana sales has exceeded their expectations. 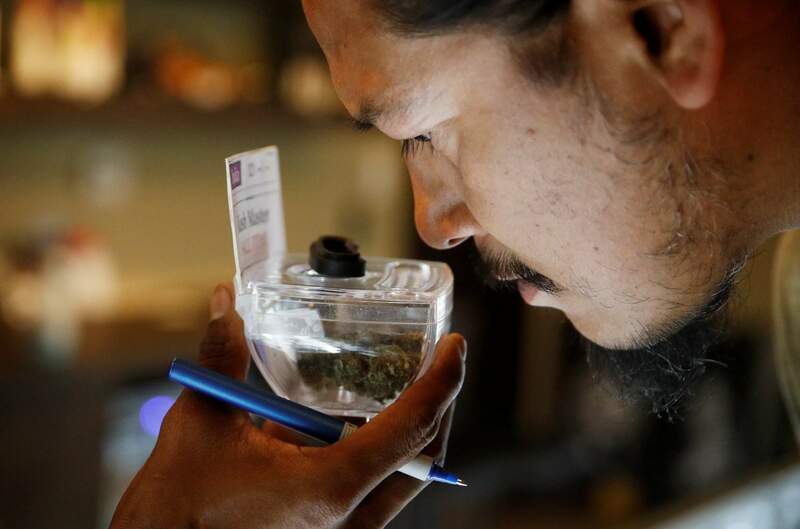 RENO, Nev. – Nevada regulators and industry insiders say the state’s first year of broad marijuana legalization has exceeded even their highest expectations, with sales and tax collections already surpassing year-end projections by 25 percent. Numbers from June are still outstanding but are expected to push taxable sales past $500 million, netting total tax revenue in the neighborhood of $70 million – with about $25 million devoted to schools. 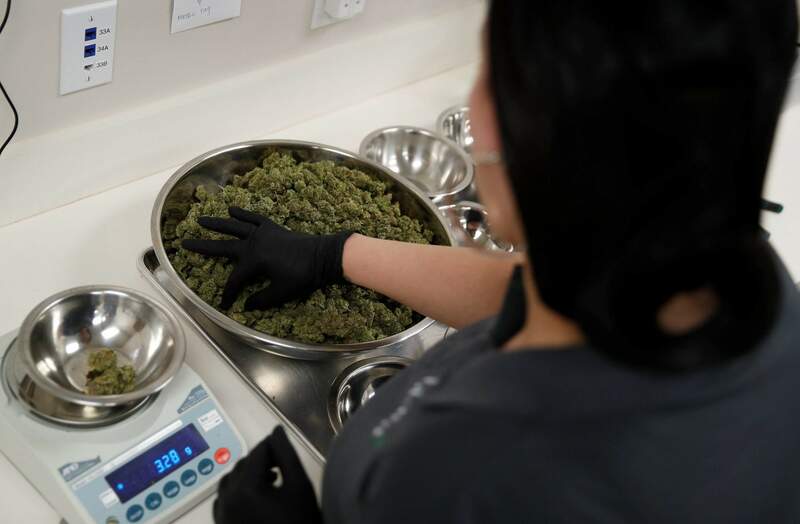 A legal battle over distribution licenses made for a rocky start last July, but Nevada’s $195 million in sales for the first six months dwarfed the totals in Washington state ($67 million) and Colorado ($114 million) for the first half-year of legal sales in those states in 2014. 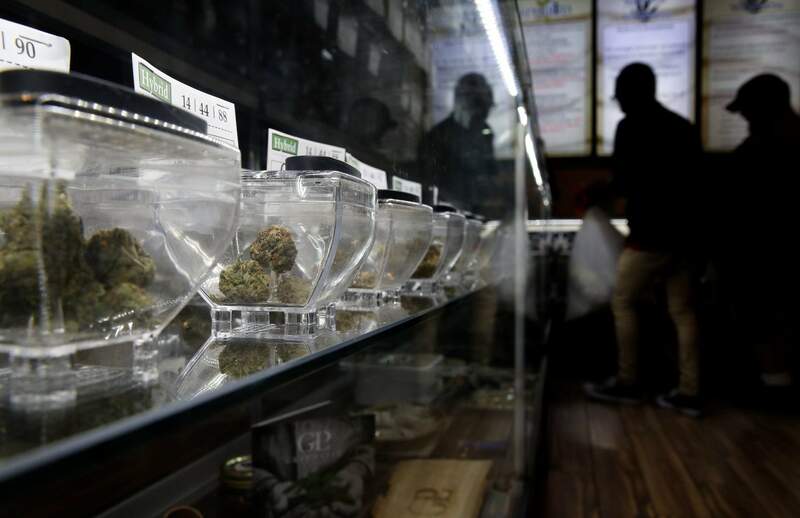 And so far, there’s no sign legal sales that began in California on Jan. 1 have cut into business in neighboring Nevada, regulators say. But not all the reviews are glowing. Some medical marijuana patients insist they were better off before Nevada legalized recreational pot. Tourists still have nowhere to legally smoke the drug, at least for now, and opponents remain skeptical of the impact on children. Nevada’s Public Safety Department plans to release early data on the trends in the next few weeks. Anecdotally, Douglas County School Superintendent Teri White said her district near Carson City had more problems with marijuana the first three months of the school year than she’d experienced her entire career. Churchill County High School Principal Kevin Lords in rural Fallon estimated student marijuana use has tripled in his district, including cases of edibles being distributed by adults. What irks him most are those giddy about the revenue numbers he says are being blown out of proportion in terms of benefiting schools. “They are celebrating the sale of marijuana products. It isn’t as though SAT scores are increasing,” said Hartman, chairman of Nevadans for Responsible Drug Policy. The 10 percent retail tax levied only on recreational sales goes to the state’s rainy day fund, a total of $26.5 million through May. Money raised from the 15 percent wholesale tax applicable to medical use as well – about $24 million through May – goes to schools, but not until about one-third is used to cover local and state administrative costs. That means about $25 million in wholesale revenue anticipated for the first full year of sales will be shared by schools in Nevada’s 17 counties based on enrollment, with $17 million likely headed to Las Vegas and surrounding Clark County and $8 million divided among the rest – perhaps $5 million for Washoe County, including Reno and Sparks. Hartman said Washoe County’s annual school budget is approaching $1 billion, and building a high school costs an estimated $200 million. Segerblom and others think the figures will grow, especially when local governments start using their authority to license smoking lounges or other public places for marijuana consumption. Currently, the only legal places are private residences in the state that attracts nearly 50 million tourists annually. The Las Vegas City Council initially backed off such a move, waiting for places like Colorado to test the waters. But it recently resumed accepting public comment on the matter, and Segerblom thinks the city will move that direction following November’s elections. The biggest criticism has come from the medical marijuana community. Broad legalization has resulted in dispensaries stocking fewer higher-potency products that cannot be sold for recreational use, critics say. Anderson said Nevada has seen the same trend as other states with dual programs of medical and adult use. He expects to propose some potential remedies before the next legislative session. Jolley, of the dispensary group, advocates making medical marijuana more accessible to patients by eliminating the state sales tax on it in the same way pharmaceutical prescriptions are exempt, and possibly lowering wholesale taxes on medical sales. Segerblom is reluctant to mess with the tax structure but says one approach might be to provide tax credits for medical pot purchases to offset insurance deductibles. Jim Lamb, vice president of the Las Vegas Medical Marijuana Association, thinks the state should provide free medical marijuana cards to anyone age 55 or older. The cards normally cost about $115 and require a signed physician’s form. Anderson insists it’s important to continue to serve the medical community one way or another. “We don’t want that access to go away,” he said.